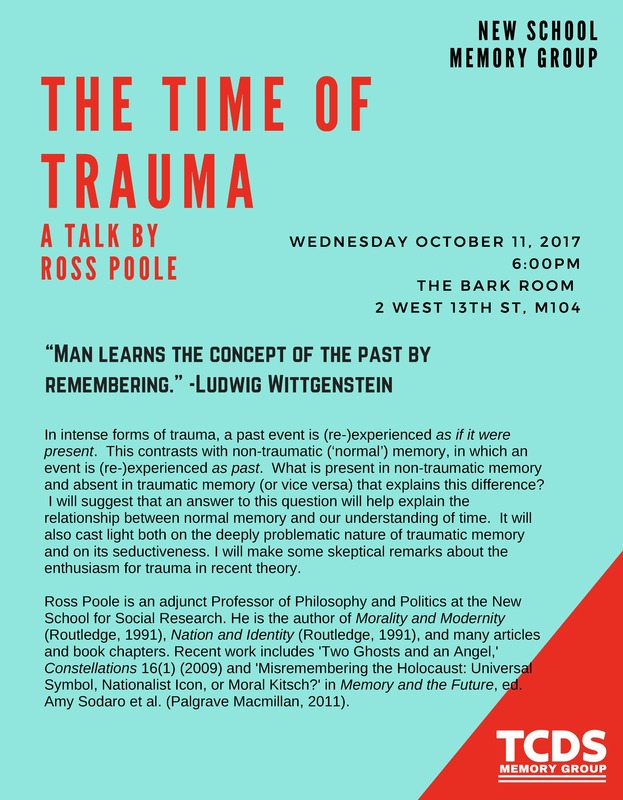 We are happy to announce The Time of Truama, a lecture by Prof. Ross Poole, Adjunct Professor of Philosophy and Politics at NSSR, on Wednesday, October 11th, 2017, 6 pm, at the New School, Bark Room (M 104), 2 West 13th st., New York, NY. In intense forms of trauma, a past event is (re-)experienced as if it were present. This contrasts with non-traumatic (‘normal’) memory, in which an event is (re-)experienced as past. What is present in non-traumatic memory and absent in traumatic memory (or vice versa) that explains this difference? In his lecture, Prof. Poole will suggest that an answer to this question will help explain the relationship between normal memory and our understanding of time. Furthermore, it will also cast light both on the deeply problematic nature of traumatic memory and on its seductiveness. He will also make some skeptical remarks about the enthusiasm for trauma in recent theory. Ross Poole is an adjunct Professor of Philosophy and Politics at the New School for Social Research. He is the author of Morality and Modernity (Routledge, 1991), Nation and Identity (Routledge, 1991), and many articles and book chapters. Recent work includes ‘Two Ghosts and an Angel,’ Constellations 16(1) (2009) and ‘Misremembering the Holocaust: Universal Symbol, Nationalist Icon, or Moral Kitsch?’ in Memory and the Future, ed. Amy Sodaro et al. (Palgrave Macmillan, 2011).